This dish gets its inspiration from the classic Northern Italian dish called osso buco (or ossobuco), a braised dish of veal shanks in white wine, broth, and vegetables that is then topped with gremolata, a simple yet vibrant parsley-garlic-lemon zest garnish. In my version, I use lamb shanks and red wine, then blend the resulting sauce into a near-smooth yet slightly chunky consistency. I think this "rustic blending" of the sauce is its winning feature as it melds all the wonderful flavors together. It is simply pure heaven when spooned over pasta or creamy polenta. This comforting dish is both easy and beyond delicious - and it gets even better on the second day, even if you eat up all the meat. Step 1: Heat oil in a large skillet over medium high heat , then add onion, celery, carrots and garlic. Sauté until softened, about 5 minutes, then transfer to slow cooker. Step 2: Season lamb shanks with salt and pepper. In the same skillet, increase heat to high and add seasoned lamb. Sear on all sides until browned, about 4-5 minutes, then transfer to slow cooker. Step 3: Turn slow cooker to high and add red wine, chicken stock, tomatoes and tomato paste, and herbs. Gently stir, cover, and cook on high for 6 hours. Step 4: Meanwhile, make the gremolata. Using a fine zester or microplane, zest the lemon (save the lemon for future use). Finely chop garlic and parsley and mix with lemon zest. Set aside. Step 5: Remove lamb from slow cooker and remove meat from the bones (make sure you remove all the bones from the sauce as some shanks have little bone pieces). Optional but recommended: With an immersion stick blender, blend the sauce in the slow cooker until almost smooth (some chunks are fine), or carefully transfer to a food processor and pulse. Step 6: Just before serving, cook the pasta in well salted water until al dente (just tender). 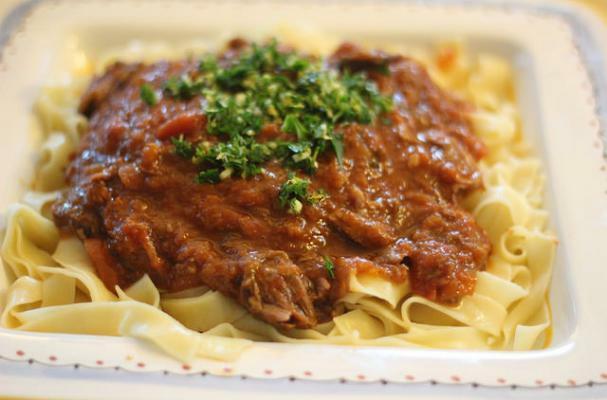 Step 7: Transfer noodles to a serving platter, cover with lamb meat, and finally, top with sauce. Garnish with gremolata on top or serve alongside the dish.